When I saw Vicki's Muse card, I had to play along! Vicki's used one of the images from my Bee's Knees Small Birds stamp set in her card, so I thought I'd use one of the other images. You can really colour outside the lines with these images, it all adds to the looseness of the design. 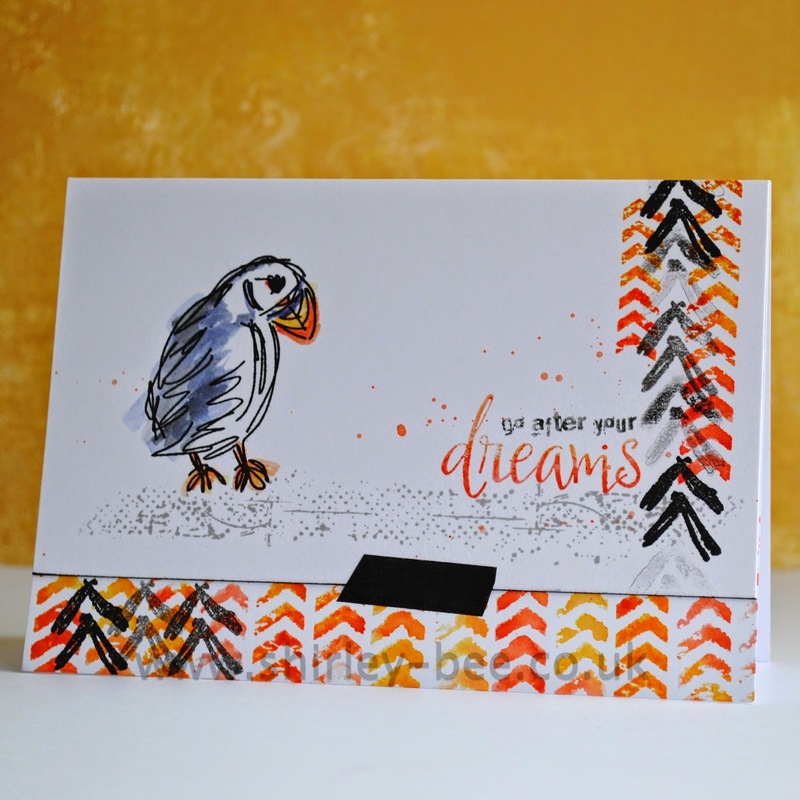 I stamped the puffin image onto a white card panel in Versafine Onyx Black, and coloured it with Ripe Persimmon, Wild Honey and Black Soot Distress Inks. I stamped a sentiment from the new Noteworthy set in black and orange. On the base card and the panel, I used the same colours and stamps from the Mixed Media Grunge set which is the April set for the STAMP club. So. If you flip Vicki's card you can pretty much see the similarities. I'm also entering this into Virginia's View - Layers. The top panel is a separate layer, and then there's washi tape as a layer. OMG, I should have known that of all of us, you would nail this style - I love the artistic feel and the bright colours! So glad you joined us at Muse this week, Shirley! Fantastic! I've ordered your birdies and can't wait! Artsy-awesome, Shirley! 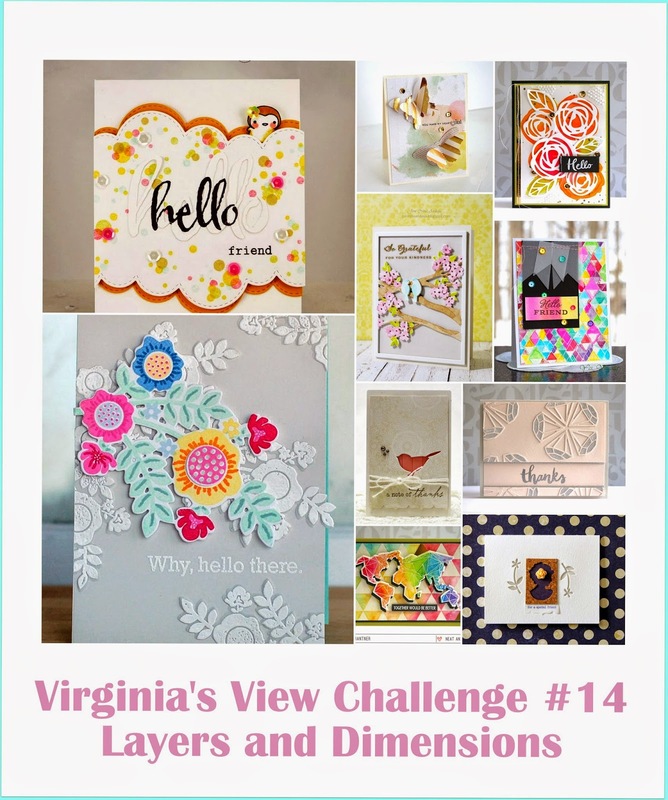 Love your take on Vicki's card! Hey Girl! Awesome inspired card [great images we used huh? ;)] -- Thanks so much for joining in at Muse! Both of these cards are amazing! Love the cool chevron borders and the colors you used. The wee bit of black tape - genius! Awwright!!! I so adore this card, Shirley! Awesome awesome CASE of Vicki's! Been wanting to play at Muse but I'm up to my neck packaging orders. Hoping I'll be able to squeeze a card in Sunday. This is so cute and a great take on the muse Shirley. Love you accents and stamping. Your puffin is just awesome! i love your bird! is that a puffin?! and the colors are beautiful! orange is a fav of mine :) great take on the MUSE challenge!